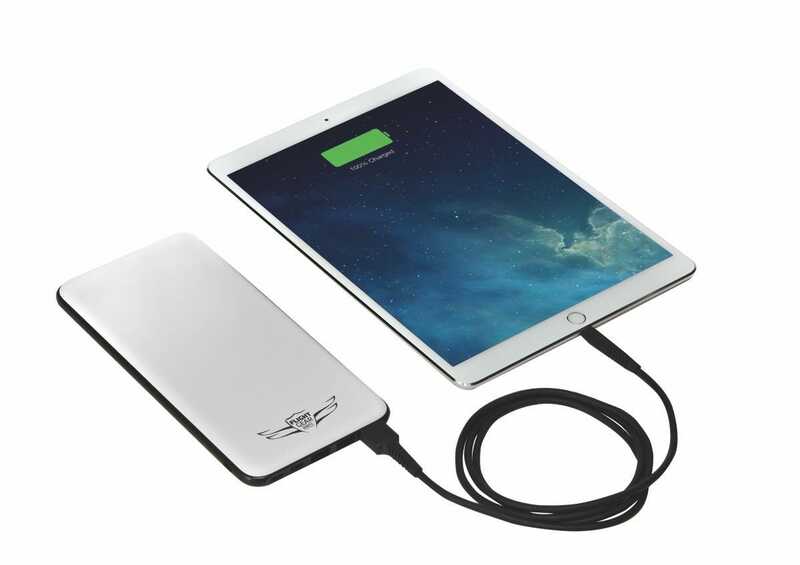 The all-new Flight Gear Backup Battery for iPad is the pilot’s answer for charging mobile devices on the flight deck. 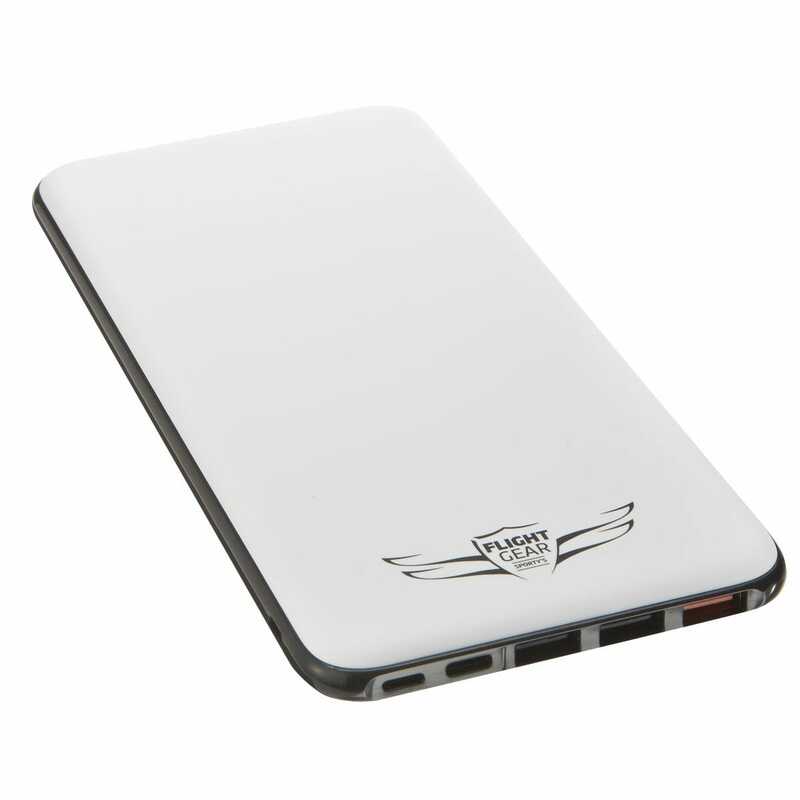 This battery packs some serious power, 20,000mAh of capacity to be exact, but its slim shape will fit in any flight bag. 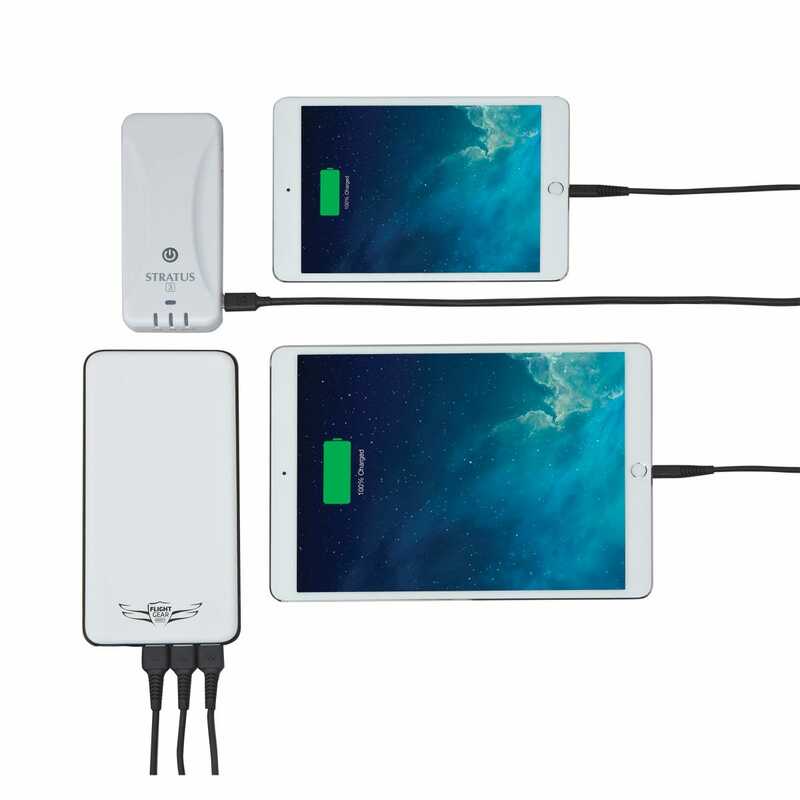 Two 3 amp USB ports deliver enough power to charge multiple iPads at the same time while those iPads are being used by the pilots. A total of four USB ports are available to charge your devices, three standard USB-A ports (like those found on computers and wall chargers) and one USB-C output port. Any time you add an electronic device to the cockpit you run the risk of interference with the radios. We’re very concerned about that problem, so we’ve tested the Flight Gear Battery pack in multiple aircraft and through hundreds of flight hours to ensure that it won’t become a nuisance in the plane. Charging this battery is as simple as it can get. No more trying to find the proprietary charging cable or a certain type of cable you may not normally carry. 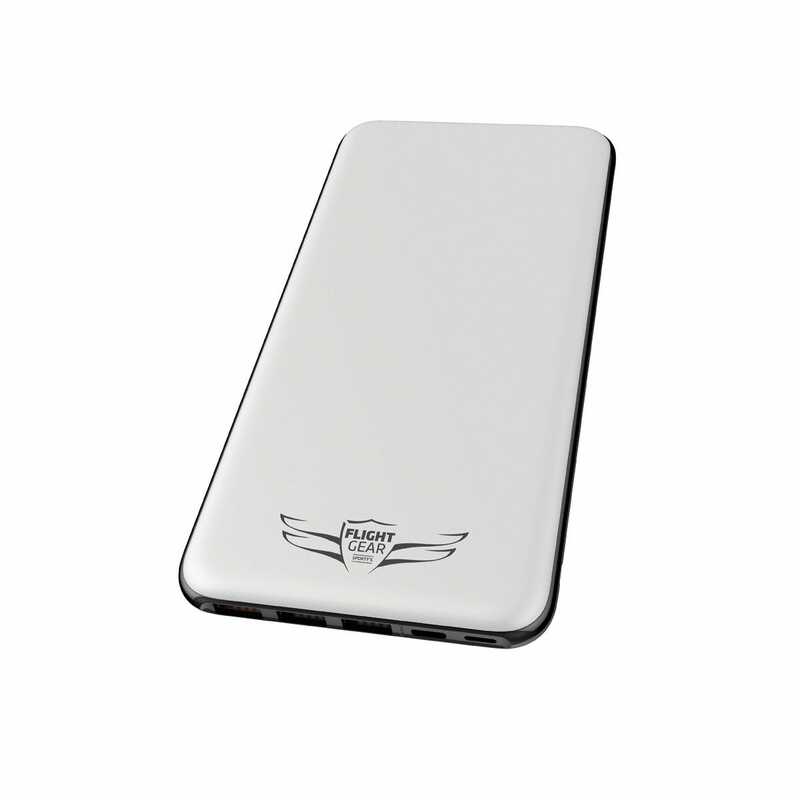 The Flight Gear Backup Battery can be charged with a Micro-USB, Type-C, or Lightning Cable. What this means is you only need one cable to charge this battery and then also charge your device. Total flexibility. The Flight Gear Battery detects the optimal charging current for any connected device and delivers that amount of power. 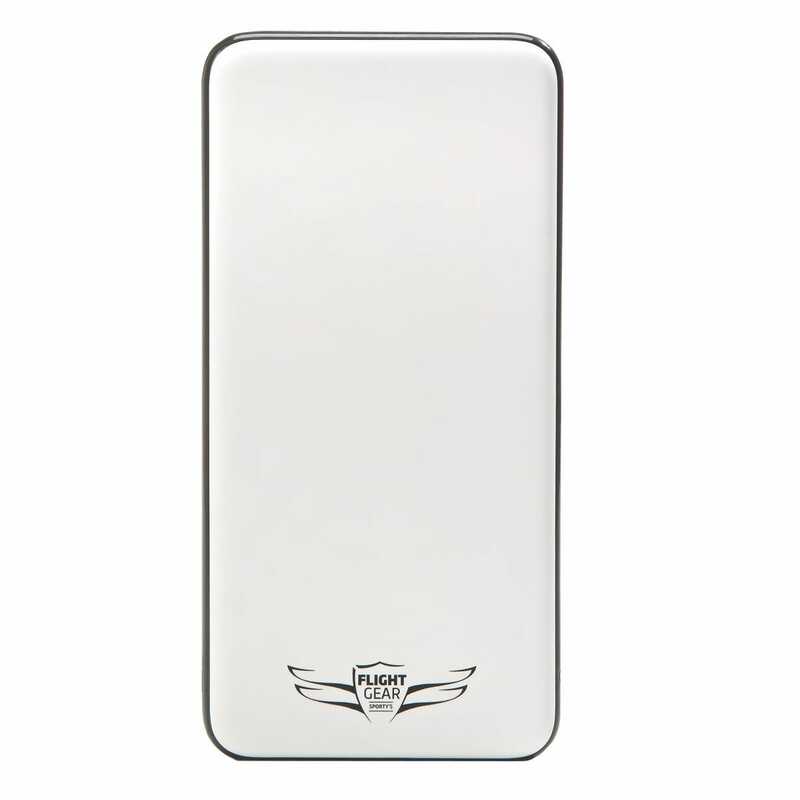 This saves the battery power and more efficiently charges your devices. The USB-C port on the battery doubles as an In or Out charging port. Based on the connection detected, the battery will either accept power from the charging cord if it’s plugged into a power source or the same port can deliver power if the battery detects that there is a battery requiring a charge connected to the cord. Pass-through charging is supported with the Flight Gear Battery Pack as well. This means that you can plug the battery into the wall and your device into the battery and both devices will charge off of the wall. Perfect for the night before a flight - now you can make sure everything is charged in one set up. Intelligent charging—detects and delivers the optimal charging current for any connected device. Built-in advanced safety features—temperature control, over-charge, over-discharge, over voltage, over-current and short-circuit protection. 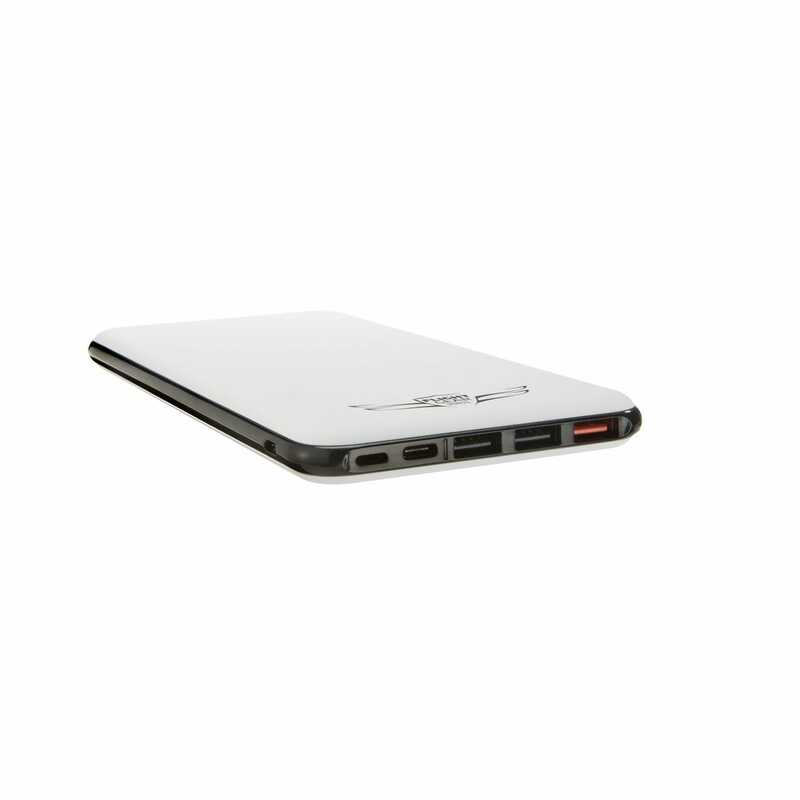 Massive capacity—20,000mAH provides 3 times the power for most iPads. 4 USB outputs—charge multiple devices at once. We regularly keep 2 iPads and a Stratus topped off at the same time. LED charge indicator—know how much power is left with a touch of a button. Charges with almost any cable—will accept micro-USB, type-C, or lightning cable charging inputs. Quick reference guide—placard information printed directly on the back of the battery. Includes a small 6" micro USB charging cable. It does not include a charging plug, but will work with any USB charger. Measures 7.75” x 3.75” x 0.5” and weighs less than 1 lb. Domestic shipping only. 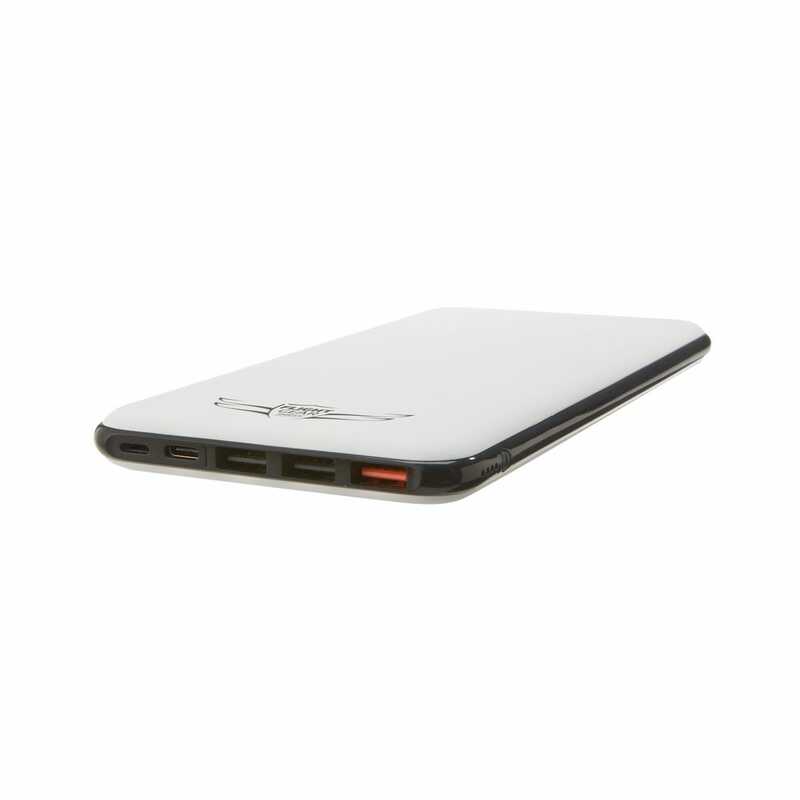 This is a great device, with plenty of capacity to charge your devices. However, be advised that it does take a LONG time to charge fully from completely depleted. I would estimate that it takes approximately six hours or more to full charge. However, a great device. It is about the size of a large iPhone. The various plug-in ports are well labeled and idiot proof. It is a perfect backup for my I pad, using fore flight, my scout and the adapter for my headset to hear Fore Flight. It works great to charge my phone, iPad and even my MacBook. It jumps to 9V and 12V output voltage on USB-C but not on the standard USB ports. Charging the battery pack happens anywhere between 8 and 11.6 Watts on 5V depending on charger and cable used. The original iPad charger with a lightning cable only supplies 9W and the FlightGear charger supplies only 8 Watts via lightning cable. So expect longer charge times via lightning cables. Same lightning cable however is able to charge at 11 Watts with an Anker charger and same FlightGear or iPad charger is able to charge 11 Watts via USB-mini or USB-C cable. works better than i’d ever expected! operated and charged 3 devices in my plane at the same time. The Flight Gear Quick Charge 3.0 Back-Up Battery Pack has four charge indicator lights. After charging a fully discharged iPad it still had four lights, indicating close to a full charge remaining. The five outputs including two different quick-charge outputs are versatile for different types of power cords. The list of airport traffic light signals, cruising altitudes, emergency engine checklist and transponder codes is a handy reference when in the air. A great add to my flight bag. Flight Gear Battery Pack with two of the three re-charge ports in use. Works great , thinner than expected, love the USB C! Does this battery backup support passthrough charging. Will it power a device and charge the battery at the same time? BEST ANSWER: Yes. For example, I flew from Centennial Airport (KAPA) to Eagle (KEGE) and had my iPad both plugged into the charger and also had the screen on bright the entire flight. When I landed my iPad battery was at a higher charge than when I started. Whoever said this thing can't charge an iPad with the iPad running is incorrect. Charging a device in use us the whole point of this thing. I don't believe the answer provided here actually answers the "pass through charging" question. To be more clear: can the battery pack be charged or topped off (i.e. from A/C power via a USB 12/24 plug) while the battery is connected to AND providing power to devices (such as the Ipad/ADS-B receiver? Yes, it can. I plug the battery into a USB charger and then connect my iPad. It charges the iPad while the backup battery is being charged. As soon as you charge the battery pack, the USB output voltage drops to 4.5V. This is not enough for devices to charge from (no current flows) but may accidentally light up the "charging" indicator on the device even though it's not actually charging. So the answer should be "no". Yes, it does support passthrough charging. What is the total charge time when charged via USB-C? BEST ANSWER: The lighting cable will take approximately 12 hours to charge. the USB-C and Micro Micro will charge in approximately 7 hours. Lightning cable with an Anker 2.4A charger will also give you the shorter charge time. The iPad charger and FlightGear charger will take longer with lightning cables. Reason is the Anker charger puts out 5.2V, not just 5.0V, which makes the battery jump into a quicker charging mode. 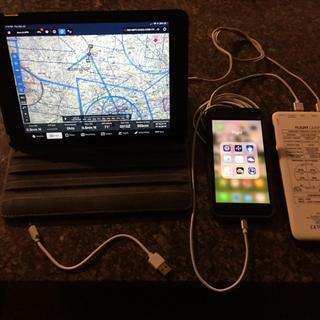 iPad and FlightGear charger work however well with USB-C and USB-Mini cables. If my IPad battery is reaching the end of its life, will this gadget by-pass the dead battery and still allow me to use my iPad, or will it only re-charge a good battery ? BEST ANSWER: No, the iPad battery will need to accept a charge for this to work. The iPad does not power directly from the external power source. Does it come with a charger? BEST ANSWER: Includes micro USB charging cable. It does not include a charging plug but will work with any USB charger. You can also charge this battery from an Apple lightning charger which is very convenient. What’s the difference between this power bank and the “USB C Power Bank 26800mAh Portable Charger 20000, 3 Inputs (5V 1.5A 2A 2.6A) & 4 iSmart Outputs (5V 2.4A 3A) Type C Battery Pack for MacBook, Nintendo Switch, Galaxy S8, Google Pixel, iPhone, iPad” available on popular e-commerce site? Seems like the specs are almost identical but more power storage at half the cost. 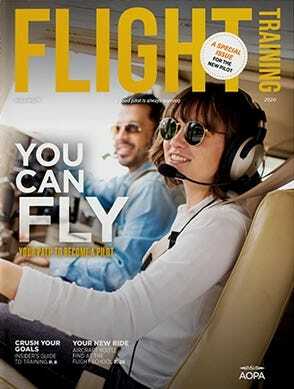 BEST ANSWER: I bought this one because Sporty's serves pilots and cares about its reputation. The quality of the electronics I've purchased from popular e-commerce sites have been very inconsistent so say the least and I don't trust them in the cockpit. Buy what you think is best for your purposes. Very similar. Only differences seem to be that the flight gear power pack comes with a handy reference card stenciled on the case. Being a lithium-ion battery, will Sporty’s ship it to Australia? 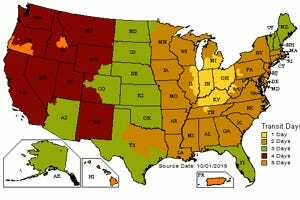 BEST ANSWER: Yes, it can not be shipped outside of the US due to regulations concerning shipping batteries. This item is not available to be shipped outside of the US. Does the 4th LED light stay on when fully charged? 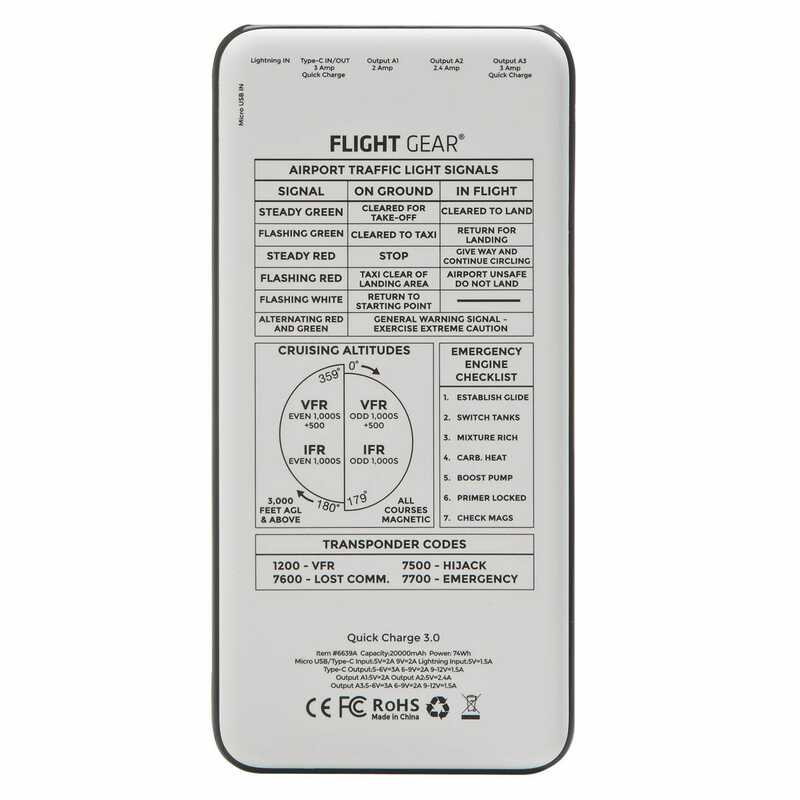 BEST ANSWER: I have found that the Flight Gear Backup Battery will behave as follows: (1) If the unit is fully charged and connected to a device, then yes, the 4th LED light (actually all 4 lights) will remain on. (2) Once you disconnect the device, the LEDs will switch off within about 15 seconds. (3) If you just want to "test" the charge level (number of LEDs illuminated) with NO device connected, power the charger ON and the appropriate number of LEDs will illuminate for about 5 seconds, and then turn off automatically. BTW, the 4 LED means that the Backup Battery is charged anywhere between 75-100% (i.e., not necessarily "fully charged"). Update--I left it on the charger a bit longer to double check and the fourth light eventually came on steady. I thought it was fully charged before because it had been on the charger for so long. However, as long as the 4th light is flashing, it is not yet fully charged. When the 4th light is on steady, it is fully charged. Yes, while it is still plugged in. It goes off when you unplug it. Yes all lights are on when fully charged. Why would it be better than EasyACC which delivers equal (20000mAh) or more (26000mAh +flashlight) at half this price ($40)? BEST ANSWER: It wouldn’t be. Buy what your reasoning tells you is the better deal. I got it for multiple reasons. 1. Easy to use in the airplane to recharge if you don’t have any other way. Nope, get the EasyACC. This is just a rebranded Aukey battery anyway. Will it pass TSA inspection?  Lithium ion batteries (a.k.a. : rechargeable lithium, lithium polymer, LIPO, secondary lithium). Passengers may carry all consumer-sized lithium ion batteries (up to 100 watt hours per battery). This size covers AA, AAA, cell phone, PDA, camera, camcorder, handheld game, tablet, portable drill, and standard laptop computer batteries. The watt hours (Wh) rating is marked on newer lithium ion batteries and is explained in #3 below. External chargers are also considered to be a battery. This battery pack is rated at 74wH so is under the 100wH limit. It should be OK. I've taken mine through TSA multiple times with no issues. If course TSA is legendary for its inconsistency and one-off agents' lack of knowledge of its own regulations. But backup batteries are ubiquitous and TSA should have no problem with this one. I have taken it thru TSA several times (Pre-check) with no issues. Note that it is not allowed in checked baggage, however, so keep it in your carry-on! What is output voltage - 5V? BEST ANSWER: On the standard USB ports, the voltage is 5.0 V but on the USB-C port, the voltage is negotiated with the device. A smartphone may get 9V, a MacBook gets 12V (with a heavy duty USB-C / USB-C cable - not with the thin one that the MacBook comes with). The output voltage is 5 volts on the 2 and 2.4 amp ports. It is 6 volts on the 3 amp port. Can I used the back up battery even if the battery of my I pad is not charging at all ? BEST ANSWER: If the battery is completely discharged then no. What is the length of the charging cable? Thanks. BEST ANSWER: Approximately 6 inches. Does this item also charge a Stratus 3? BEST ANSWER: Yes, it will charge the Stratus 3. What are the dimensions of this battery? BEST ANSWER: Measures 7.75” x 3.75” x 0.5” and weighs less than 1 lb. What is the standby life of this unit (i.e. how long will it hold its charge without being plugged in or used? BEST ANSWER: We expect that the charge will remain for at least 6 months. The Lithium-ion battery will discharge over time without being connected to a device. If you charge it with a USB-C and a Lightning cable at the same time, does it charge faster? BEST ANSWER: No, it will only charge from one cable. BEST ANSWER: Is is warranted for one year. Is it possible to monitor the charge remaining in the Flight Gear Backup Battery? BEST ANSWER: Yes, it has a status indicator. How many iPad mini recharges (from empty) will this charger support before it needs to be recharged? BEST ANSWER: It will charge the iPad 3-4 times. What’s the main difference between this power bank and this “USB C Power Bank 26800mAh Portable Charger 20000, 3 Inputs (5V 1.5A 2A 2.6A) & 4 iSmart Outputs (5V 2.4A 3A) Type C Battery Pack for MacBook, Nintendo Switch, Galaxy S8, Google Pixel, iPhone, iPad” available on popular e-commerce site? It seems to have the same form factor with more storage capacity at half the cost.